The idea that the revolutionary Shiite al-Dawa Party, the Supreme Council for Islamic Revolution in Iraq, the Badr Organization (trained by the Iranian revolutionary guards), all of them with close ties to Tehran, would welcome a permanent US military presence in Iraq was always a chimera. Most Shiites who voted on Sunday thought they were voting for an end to US hegemony in their country. This is why it is so bizarre that the US Right is interpreting the elections as a victory for the Bush administration. 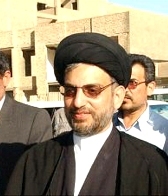 Interim President Ghazi al-Yawir expressed hope that a substantial withdrawal of Coalition troops could be effected by the end of 2005, and this hope seems widely shared in Iraq. Al-Yawir cautioned that it would be unwise for US forces to just up and leave immediately, given the chaos in the country, and the Western press often latched on to this part of his statement rather than his call for withdrawal by the end of the year. That is, it might on the surface look as though al-Hakim and al-Yawir are in disagreement, but they probably are not. Interim Defense Minister Hazem Shaalan also said that it was too soon for US troops to pull out. But Shaalan is unlikely to be powerful in the new government, and it probably isn’t important what he says. Complaints continued Tuesday that substantial numbers of Iraqis had been excluded from voting because of a shortage of ballots. In the north, bitter Chaldean Christians charged that the Kurdish leadership deliberately kept ballots from reaching them. The UIA spokesmen are saying in some provinces they got 90 percent of the vote, and believe that they will gain about half the seats in the 275-member parliament, or 138. They would have needed two-thirds, or 182 seats, to dispense with any coalition partner inside parliament in forming the next government. The Kurds believe that they actually did better than did the list of interim prime minister Iyad Allawi, and will garner about 65 seats, or nearly a quarter. Al-Hayat reported that interim Foreign Minister Hoshyar Zebari, a Kurd, even predicted that the Kurds would take as many as 75 seats. “This,” he said, “is what we always wanted.” The Kurds have long been marginalized in Iraqi politics. It should be noted that the Kurds will have done unusually well because the Sunni Arab vote was light, Because the election was held on a proportional basis, if the 20 percent of the population that is Sunni Arab stayed home, they actually increased the percentages gained by the Shiites and Kurds. There is already speculation about what blocs might emerge in the new parliament. One possibility is an alliance between the Kurds and the United Iraqi Alliance. Such an alliance would be difficult, since the relatively secular-minded Kurds won’t be enthusiastic about the imposition of religious law, something the UIA will certainly want. On the other hand, if the Kurds can provide the votes to form a government, they would be in a good position to gain most of their demands for a loose federalism and a consolidated Kurdistan province. Another possibility would be for the Kurds to join the Allawi list, that of al-Yawir, and that of Adnan Pachachi to form a sort of secular/Sunni bloc. If the UIA holds together, however, it would still have the best chance of forming a government, by picking up several small parties. The secular-Sunni bloc would need all the small parties plus the defection of some parties in the 11-party UIA coalition to form a government. At the moment, it seems an unlikely scenario and would probably produce a very unstable government. A UIA/Kurdish alliance would be far more stable and powerful as a government, and might be a good way of moderating the extremes in both groups. But it would further marginalize the previously dominant Sunni Arabs, many of whom are already in violent opposition to the new political order. One scenario has Iyad Allawi’s party getting over a third of the vote, allowing him to block the formation of a presidential council unless he is promised the prime ministership. Initial reporting of the election results, which is admittedly still vague, however, does not suggest that Allawi’s list did that well.